Studies have shown higher rates of adult and childhood cancer and also birth defects around municipal waste incinerators. The results are consistent with the associations being causal. Incinerator emissions are a major source of fine particulate, of toxic metals and of more than 200 organic chemicals, including known carcinogens, mutagens and hormone disrupters. Emissions also contain other unidentified compounds whose potential for harm is as yet unknown, as was once the case with dioxins. Since the nature of waste is continually changing, so is the chemical nature of the incinerator emissions and therefore the potential for adverse health effects. Incinerators produce bottom and fly ash, which amounts to 30 to 50 per cent by volume of the original waste (if compacted), and require transporting to landfill sites. Abatement equipment in modern incinerators merely transfers the toxic load, notably that of dioxins and heavy metals, from airborne emissions to the fly ash. This fly ash is light, readily windborne and mostly of low particle size. It represents a considerable and poorly understood health hazard. Two large cohort studies in America have shown that fine (PM2.5) particulate air pollution causes increases in all-cause mortality, cardiovascular mortality and mortality from lung cancer, after adjustment for other factors. A more recent, well-designed study of morbidity and mortality in postmeno-pausal women has confirmed this, showing a 76 per cent increase in cardiovascular and 83 per cent increase in cerebrovascular mortality in women exposed to higher levels of fine particulate. The fine particles are primarily produced by combustion processes and are emitted in large quantities by incinerators. We need to support zero-waste alternatives such as waste reduction, product reuse, recycling and composting, and oppose the planned waste incinerator in Hong Kong. There has been strong opposition to the government’s proposal to expand our landfills, which are nearing capacity. Residents living near the landfills are concerned because of the odour caused by the waste. Other people are against the expansion proposals because they will encroach on country parks. Another proposal is to build an incinerator. If this option is chosen, I hope the government will give careful consideration to the site and have a thorough public consultation. The most effective way to deal with this problem is to reduce the volume of municipal solid waste generated. The administration should be putting more resources into the recycling industry. One person was killed and five injured when a garbage incinerator blew up on Thursday afternoon in Shanghai. One person remains unaccounted for. Police received reports at about 3:15 p.m. that a garbage incinerator on Suide Road, Jiading District, had exploded, causing a workshop to collapse and burying several people. One person died at the scene and another is missing. Five people have been rescued from the rubble and taken to hospital. Rescue work continues. An investigation is underway. The Fifth Issue of Eunomia’s Residual Waste Infrastructure Review, published today, shows that residual waste treatment facilities already in the pipeline could limit the rate of recycling in 2020 for local authority collected (LAC) wastes in England to no more than 60%. This limit will be in place for as long as the infrastructure remains operational and well beyond 2020 unless contracts can be renegotiated. If the country is successful in its efforts to reduce waste arisings or if more treatment capacity is commissioned, this will further limit recycling rates. Meanwhile, Scottish and Welsh authorities have invested in less infrastructure and will be able to achieve much higher recycling rates. This is on the conservative assumption that only the 2 million tonnes per annum (tpa) of residual waste treatment capacity commissioned by local authorities that has reached at least ‘preferred bidder’ status reaches financial close. The finding is in stark contrast to the potential recycling rates for LAC in the devolved administrations, which the report shows could reach 82% in Scotland and 79% in Wales. The report is based on local authorities’ annual WasteDataFlow returns to Defra, and Eunomia’s Facilities Database, which holds information on all residual treatment facilities in the UK (both operating and under development) to model the balance between the two. Data is analysed on both a national and regional basis, to provide a detailed picture of where insufficient or excess capacity is anticipated. GUANGZHOU – Five people were seriously injured when a water-cooling pipeline cracked at the city’s major garbage treatment plant yesterday, local authorities said. Those who have been protesting the building of more garbage incinerator plants said the accident gives them even stronger convictions that the facilities are not safe. Meanwhile, plant officials still maintain the incinerators are safe and eco-friendly. A large amount of boiled water and steam leaked from the pipeline after the accident, causing the injuries, according to a statement from the Guangzhou urban planning and administrative committee. The five were immediately sent to a nearby hospital for treatment, said Li Tinggui, the committee’s director, adding all were in stable condition. Initial investigations indicated that the accident was caused by a sudden burst of the No 1 water-cooling pipeline at the controversial Likeng garbage incinerator, which was put into operation in 2005. “I saw a huge stream of mushroom-shaped smoke and heard a terrific noise following the burst,” said a villager who lives near the plant. Other facilities at the incinerator, located in Baiyun district of Guangzhou, capital of Guangdong province, ran smoothly after the accident, according to the government release. “We will repair or replace the pipeline as soon as possible to ensure its normal operation,” Li said. Following the accident, local authorities stopped the operation of the plant. Francois Guyon, general manager of Veolia Environmental Services, the France-based operator of the Likeng project, said the accident had nothing to do with technology and facilities. “This garbage incinerator has been operating very well since 2005. It was designed as an environmental-friendly project,” he said. The general manager was not in Guangzhou yesterday, but he told China Daily in a telephone interview that the accident also had no relation to the freezing weather as the city witnessed a sharp drop in temperature. Following the accident, netizens said the local government should more strictly supervise the garbage treatment project to ensure that it runs smoothly. “We don’t trust the so-called state-of-the-art facilities for garbage incinerators,” said a netizen at the city’s popular online forum of dayoo.com. “No one can ensure the incinerator’s safety in operation, let alone the great damage it poses to people’s health and the environment,” the netizen said. At the end of last year, local authorities suspended construction of another planned large garbage incinerator in Panyu district due to a wide range of protests from local residents over fears of health and environmental damages. In addition to Guangzhou, major Chinese cities, such as Beijing and Shanghai, are also planning to build incineration plants to tackle the huge amounts of garbage. Most of China’s garbage meets with one of three fates: around half is placed in landfill, 12% is burned and a little under 10% used for fertiliser. The rest is mostly left untreated, much of it simply dumped. However, plants that burn waste – and in the process generate electricity –are on their way to playing a significant role in the disposal of Chinese refuse. […]China is set to increase its daily waste-processing capacity by 400,000 tonnes over that five-year period, said Shi. New investment of 140 billion yuan (US$22 billion) will be pumped into the sector, bringing total spending on waste-disposal to 260 billion yuan (US$41 billion). […]Evidently, China is gearing up for a Great Leap Forward in garbage incineration. The path China has chosen will not be smooth. Local governments find themselves squeezed between mountains of rubbish piled around their cities on one side, and residents’ objections to incinerators on the other. Miami-Dade’s newest toxic playground is the City of Miami’s Douglas Park. City officials say arsenic, lead, barium, and other hazardous substances have been found at levels far above the threshold considered safe for human exposure. The park will be fenced off and closed to all visitors, says assistant city manager Alice Bravo. No clean-up plan has been announced. Douglas Park is a former quarry that was acquired by the city in the 1930s to be used as a dump site for incinerator ash and other hazardous materials. It is less than a mile from Coconut Grove’s former Old Smokey municipal trash incinerator. The park was tested for toxic soil in August as part of a wider study to gauge the residual fallout from decades of pollution. The incinerator closed in 1970, but soil in the immediate vicinity is highly contaminated, county files reveal. Initially, city and county officials overseeing the cleanup and monitoring efforts said the soil readings at Douglas Park remained in the normal range for arsenic and other contaminants — consistent with other areas in a dense, urban setting. But a follow-up inspection, explains Bravo, revealed melted glass and other debris visually similar to the toxic soil found at other ash dump sites. Subsequent soil analysis confirmed the suspicions of county environmental regulators, prompting the park’s closure. Early Friday morning, city workers began turning away visitors from the multiuse facility at Douglas Road and SW 28th Street. A parks department employee, who declined to provide her name, said she and other workers had not been told the cause of the closure but added that work crews were arriving soon to fence off the ten-acre park. Bravo said the soil test results coincided with the discovery of historical records that indentified the park as a former ash dump site. The city and Miami-Dade’s Department of Environmental Resources Management will work in tandem on the cleanup. Coconut Grove’s Blanche Park and Merrie Christmas Park were closed in September after officials discovered buried incinerator ash. The City of Miami’s Melreese Golf Course and adjacent Grapeland Park are also former dump sites for ash, though they remain open. Earlier this year, a private, multimillion-dollar, waterfront estate in Coconut Grove was found to contain more than 100,000 tons of soil tainted with incinerator ash. Bravo says city officials are searching records for other former dump sites. Incinerator ash — a grainy mix of carcinogens such as arsenic, barium, lead, antimony, and PCBs — is often detected by the telltale presence of melted glass and metal. The chemicals can easily leach into groundwater, contaminating the drinking supply. When Beijing residents visit Hong Kong, they sometimes quip that the territory is like a breath of fresh air, especially in winter when the Chinese capital can be bathed in extremely hazardous smog for days on end. While most Hong Kongers can understand that feeling – having seen countless images of mainland cities wrapped in smog – they are far from happy with their own air quality. According to the Hedley Environmental Index, compiled by the University of Hong Kong, the territory had 69 clear days – when the levels of five pollutants complied with World Health Organisation guidelines – last year. 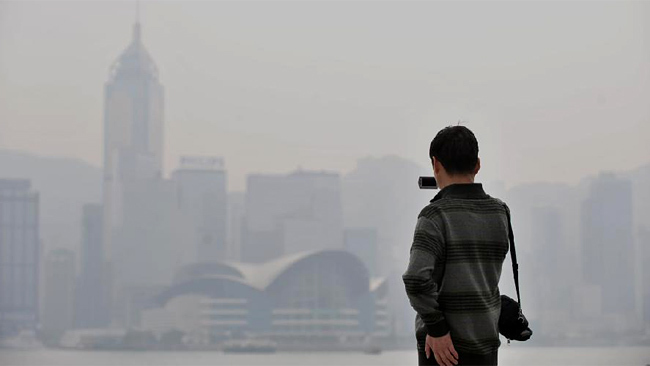 The pollution cost the economy an estimated HKD40bn ($5bn) in healthcare costs and lost productivity. A law banning idling engines has come under fire for having only a minimal impact on improving air quality, nearly two years after it was introduced. Lawmakers said the Motor Vehicle Idling Ordinance had not stopped idling engines, which caused pollution and were a nuisance to pedestrians. Environment chief Wong Kam-sing defended the ban, which came into effect in December 2011, saying it had reduced the number of complaints about roadside discomfort caused by hot exhaust fumes and noise pollution. Environment bureau statistics show that in the past two years, 3,070 idling vehicles were timed but only 86 fines were issued. Most were handed out to drivers of non-franchised buses and private vehicles.